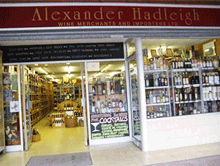 Alexander Hadleigh Wine and Spirit Merchants offer a range of wine gifts online, including champagne and chocolates, fine spirit and Liqueur gifts, pate with wine or port, glasses and gifts. actioned at the checkout stage, where a message can also be included. Shipping costs can be located by clicking on delivery or at the checkout stage. For destinations outside the UK mainland, click on delivery to check options or please email the full address for us to quote.